“JUST CONNECT.” LUXROBO wants you to simply connect its MODI modules to create an IoT or robotic device in seconds. 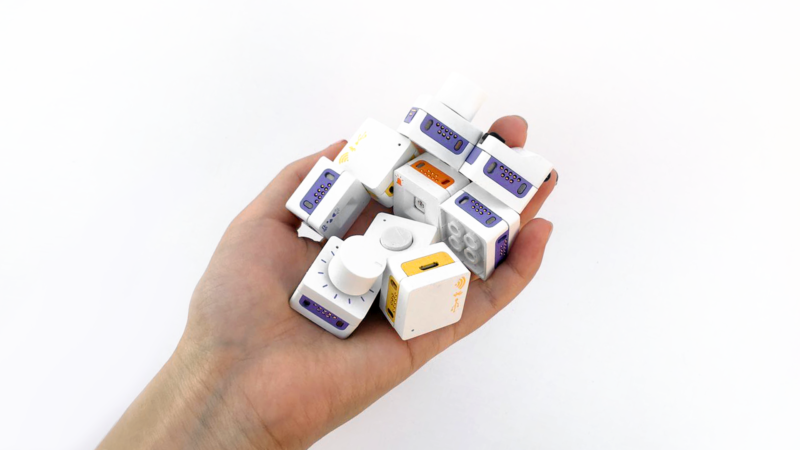 MODI is a set of cube-shaped modules that LUXROBO launched on Kickstarter.com on October 14th. It has already reached its funding goal of $30,000 in less than three days. With MODI, you can quickly and easily create devices like a theft detector, an RC car, a mini Segway and much more. MODI comes with 13 different modules. They are color-coded into three different types: Input, Output and Setup. LUXROBO plans to add numerous other modules to its line-up soon. To take a full advantage of your MODI modules, you would customize the interactions among the modules through MODI Studio, LUXROBO’s simple graphic coding tool. You just need to drag and drop the commands. You can also convert the graphic coding into C Language (with other languages to be added) instantly. The first thing you notice about MODI is its simple, elegant, minimalist design. 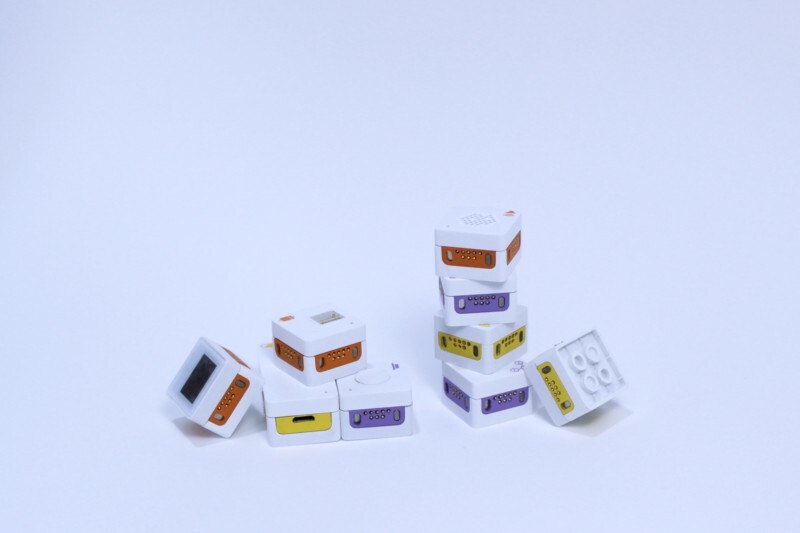 You may also be surprised to see how small the modules are, only about 2.5 cm wide and long, and 1.5 cm tall. In such a compact dimension, LUXROBO has packed in PCB, MCU and its unique magnetic connection mechanism, in addition to the apparatus that supports each module’s unique function. Taking advantage of each module’s MCU, each MODI comes with MODI OS embedded. This feature enables each module to do its own processing and store memory. Each MODI is a smart module. One of the many benefits is MODI modules do not need to be connected to a PC or some other form of a master system to function on their own. Putting MODI modules together is a pure joy. Each module’s four sides are all equipped for MODI’s unique magnetic connection. When placed close to another module, a pair of magnetic prongs come out slightly to form a tight and secure magnetic connection with the other. It is a lot of fun to try the automatic magnet connection over and over. Another advantage of MODI is its compatibility with Lego blocks. You can easily recycle the Legos or Lego-compatible blocks that you may have stored away to build a nice housing to your MODI devices. LUXROBO aims to make IoT and robotic technologies more accessible for everyone, and that goal is captured in their vision of “Robotics of Things.” With its Kickstarter campaign, LUXROBO has taken a big step towards its vision of Robotics of Things. Until November 22nd, you can back LUXROBO and get MODI modules at approximately 40% off the estimated prices. LUXROBO’s roots are in robots. The founding team and core R&D members studied robotics together in college and have entered and won numerous international robot competitions together. LUXROBO was founded with the vision “Robotics of Things,” making robotic and IoT devices readily accessible for everyone. LUXROBO is young and fearless. It was founded while its core members were still in college. It had no fear in developing its own OS for MODI and its own SW coding tool in MODI Studio. Even with MODI still in development and with no revenue stream to show, LUXROBO has been honored and recognized as one of Korea’s top technology-based startups, including being awarded Top11 at this year’s Echelon Asia Summit. LUXROBO is ready for next big steps and challenges. LUXROBO has supplemented its young talents with experienced engineers and marketers from Samsung Electronics. With the Kickstarter campaign under way and supply of MODI modules to the UK soon to follow, LUXROBO is ready for a take-off. Dieser Eintrag wurde veröffentlicht in Crowdfunding, Development, English, General, Hardware und verschlagwortet mit Kickstarter, MODI, Modular von Sebastian Trella. Permanenter Link zum Eintrag.